Anyone who rides horses knows how calming riding a good horse can be. Children often enjoy the same stress relief as adults when riding. Riding horses teaches them responsibility and respect for animals as well. Starting with a good riding foundation gives children a hobby the can enjoy for a lifetime. Start with a well-rounded, experienced horse that is calm and forgiving when teaching a beginner. When teaching a child about horses and riding, safety on and off of the horse is a major concern, and should be of utmost importance. When approaching an animal that can weigh over 1,000 pounds, children should exercise caution. Never allow the child to walk behind a horse or run up to a horse. Have your student rider talk to the horse and approach him from the side, avoiding the horse’s blind spots. Since horseback riders have as many injuries as motorcyclist, according to the Troxel Safety Center website, it is important that riders wear a well-fitting helmet with a chin strap. Certified equestrian helmets have shock-absorbing liners that help prevent brain injuries from horse riding accidents. Also, wearing riding boots with a good heel helps prevent a child’s foot from slipping through the stirrup. Breakaway stirrups and toe stoppers also help prevent riding accidents caused by the rider’s foot slipping. Young riders often struggle with balance when learning to ride. Teach your rider to sit in the center of the saddle with his back straight, but not tight and stiff. Leaning to either side will cause your young rider to slip, so make sure his weight is distributed evenly in each stirrup. According to the Meredith Manor website, the line between the rider’s ear, elbow, hip and ankle should be straight to help ensure the proper balance. The basic commands any young rider starts with are walk and stop. Teach the rider how to cue the horse to stop before ever moving forward. Have her slide her hands down the reins and pull back in a steady, even motion when asking for a stop. Moving forward often requires a tap of the heel or a “clicking” noise. Have the youngster use the cue while you lead the horse. 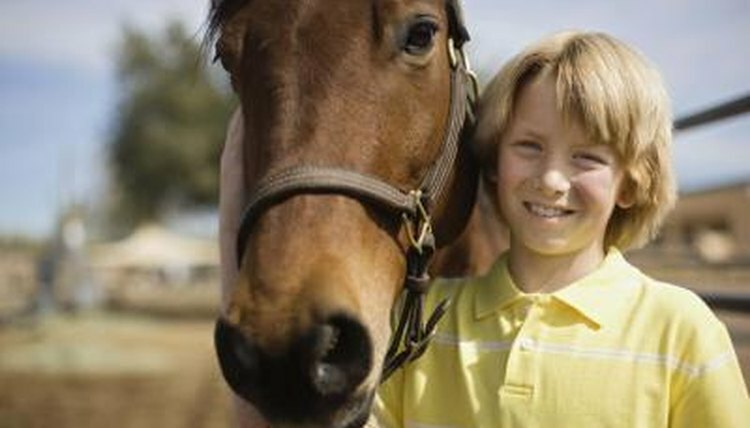 Children should learn how to direct rein, or turn the horse by pulling his nose in the direction she wants him to turn. After learning how to walk, stop and turn a horse, children need more practice. Implementing riding games helps keep the rider and horse interested in learning. Musical Chairs, The Boot Game and Red Light Green Light all are horseback riding games suggested by Ask the Farrier. After all, practice makes perfect.